PSM is an important part of Medical PG Entrance. Most aspirants find PSM(Or SPM Or Community Medicine) very boring and very vast. One of the very important topics of PSM is Biostatistics. But all books available For Biostatistics (PSM) is very vast. So Here We Are Providing here Hand Written Note of Biostatistics For NEET PG, AIIMS & Other PG Medical Entrance. 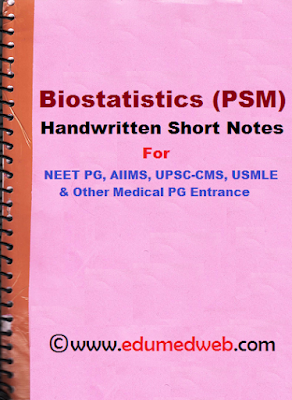 This Hand Written Short Note Explains Biostatistics Very Easily And Its Contents Are Sufficient To Solve MCQs Asked In NEET PG, AIIMS & Other PG Medical Entrances. Basic Knowledge Of Standard Error, Standard Division, Mean, Median, Mode And Normal Distribution. In Addition, You Will Need A Little Knowledge About Screening Tests, Sensitivity, Specificity, PPV, MPV And Their Relation To Each Other. Knowledge Of What Happens When Tests Are Arranged In Series And When Tests Are Arranged In Parallel. Brief Knowledge Of Guttman Scale, Likert Scale And What Is Distinction Of Characters In Categorical Test And Quantitative Test. Knowledge of which test to apply, whether the test is qualitative or quantitative and in which degree it can be placed. Brief knowledge of bias, confounding and effect modifier and you need to have your concepts cleared.